The Kindergarten curriculum at Learning Circle Preschool grows out of the same goals and philosophy as the preschool curriculum. As in preschool, the Kindergarten curriculum with its enriching classroom environment, stimulating materials, the guidance and motivating strategies offered by experienced teachers, offers students the foundations for their optimum development. Underlying every aspect of the curriculum is the teacher’s appreciation and understanding of the way Kindergartners learn. That understanding forms the basis of a framework of expectations that are both reasonable and achievable. Teachers observe each child and collect information about their strengths and weaknesses, so that each child’s individual interests and learning style are factored into the curriculum as it’s developed. Teachers also consider the skills, concepts, and knowledge children must become familiar with at the Kindergarten level in order to meet or exceed state standards and goals, and in order to make a smooth transition to First Grade. As in preschool, Kindergartners continue to learn best through playful and active interactions with their environment, engaging in activities that are deeply meaningful to them. It is the teacher’s role to facilitate, plan, watch, listen, model, question, extend, observe, and help children make connections to both materials and the other children with whom experiences are shared. The Learning Circle Preschool curriculum provides children with the extended periods of time they need to play, to plan, to reflect on past experiences – time to practice and connect new experiences and knowledge to that which is familiar and known. Each child follows a unique timetable as his or her development unfolds. At Learning Circle Preschool, we utilize a highly individualized approach. Teachers use the concept of “scaffolding learning” in their classroom approach. As children move towards mastery of a concept or skill, teachers gradually decrease the level of support offered, until children work independently. (“I do it and you watch; I do it and you help; you do it and I help; you do it and I watch”) We strive to offer each child the support, stimulation, and appropriate challenges necessary for a strong foundation for confident, life long learning. We base specific curriculum choices on careful observations of children in the classroom environment, and on the Massachusetts Curriculum Frameworks. The school uses Teaching Strategies Gold and the Creative Curriculum Developmental Continuum for recording observations, planning, assessment, and communication with parents about development. In addition, our curriculum development is informed by the National Association for the Education of Young Children’s (NAEYC) current standards reflecting best practices for the education of young children. In order for children to feel supported and confident in school, great emphasis is placed on creating an environment that promotes a sense of safety and well-being. We strive to assure that children know that they will be listened to, and know that their ideas will be valued. Our goal is to have children feel Learning Circle is a place where needs will be met and feelings acknowledged. Although many Kindergartners are able to manage their feelings and learn strategies to self-regulate, those children who need comfort or reassurance, or need help dealing with strong feelings like anger, frustration, or sadness, are supported. Teachers help children develop strategies to express their feelings and resolve the social problems that may arise during their day at school, actively teaching strategies for problem solving with peers. Children are encouraged to draw pictures and tell stories, and write about their families and life at home. Children’s work is respected, valued, talked about, and displayed often. We encourage parents to bring in photos of children and families, so that we can create class albums, books, and displays that feature family life. Community life and shared experience at school are documented with photos, panels of artwork and/or descriptions of past activities. With these, the children can remember, reflect on, and share past experiences with peers, teachers, and families. We acknowledge and support individual learning styles and interests. Kindergartners are encouraged to initiate play, make choices, express preferences, demonstrate competence, and take on responsibilities, in partnership with teachers. Cooperating with others and with school and societal rules. The school uses Second Step, a social/emotional curriculum that uses books and picture discussions to highlight specific areas of social/emotional skill development. We support an anti-bias approach to curriculum development that encourages the sharing of different perspectives and feelings among children, and involves children directly in conflict resolution and in conversations about fairness, as they become able to participate. We strive to help children find common ground in shared experiences as we support a growing appreciation of the rich diversity among individuals. Attention to diversity permeates every aspect of the curriculum at the school, and is a constant consideration as teachers plan classroom experiences for children. When teachers evaluate and reflect on classroom life, they consider the messages that are conveyed by their curriculum decisions. Teachers think about the ways children use and experience curriculum choices, the quality of interactions between children and adults, and the ways in which the classroom environment (with all its diverse materials and experiences) can support the goals of the anti-bias curriculum. The materials and activities presented to Kindergarten children project diverse racial, gender, and age attributes, and teachers are attentive to the principle that the books, dolls, photographs, and music used reflect the lives of enrolled children and accurately reflect a diverse society. Our communications with families invite both direct participation and the sharing of materials, perspectives, and ideas, between home and school. Children develop communication skills – speaking, listening, reading, and writing – continually as they share experiences throughout their time together. 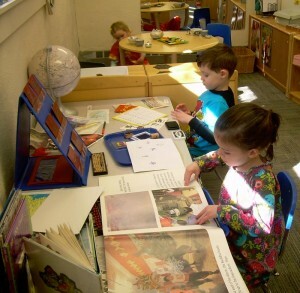 Thoughtfully chosen books are a central feature in the Kindergarten classroom, and this access to fine literature is meant to encourage an interest in, and enjoyment of literature. Teachers actively work to increase each child’s vocabulary and fluency with language by encouraging children to talk about their experiences, to describe their play, ideas, and feelings, and to participate in daily activities such as meetings, picture discussions, flannel board use, storytelling, and dramatic play. Because the school environment offers diverse materials and opportunities to children, it is content-rich – that is, there is always a great deal to both talk and write about. Teachers listen, pose questions, foster extended conversations, and offer models for describing, initiating play, problem solving, expressing feelings, and sharing ideas. The classroom environment is print-rich as well, with room area labels, signs, charts, etc. 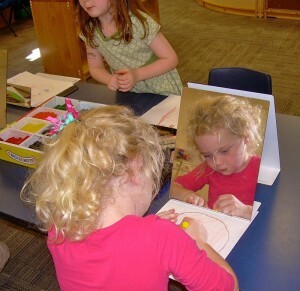 Writing tables offer daily opportunities for drawing and writing with a variety of tools. Journals offer an opportunity for children to either dictate or write their own stories. There are many opportunities for children to develop class books, observation records, recipes, etc. that support class themes and interests. Kindergartners are encouraged to continue to play with sounds and letters through listening to and reciting poetry and rhymes, clapping games, musical experiences, etc. The teachers promote a growing awareness of letter/sound associations as children learn to recognize the letters of the alphabet, and begin to read words by sight. Inventive spelling is encouraged in children’s free writing (writing words the way they sound). Children continue to develop book handling skills and familiarity with the conventions of print. We make a variety of tools for drawing, painting, and writing available to children, in support of the muscle development needed to hold and control writing instruments. Activities that support visual/perceptual skills offer foundations in physical development necessary for comfortable writing skills. At the Kindergarten level, it continues to be important that teachers offer a variety of enriching language experiences so that children develop personal enthusiasm and love for fine literature and personal communication through reading and writing. Children explore mathematical concepts with a hands-on approach that uses concrete, manipulative activities in support of a solid foundation in mathematics, and lays the groundwork for symbolic understanding. As children investigate, they are free to express their thoughts, communicate their ideas, problem solve, and come to conclusions with confidence. Concepts of number, estimation, measurement, patterns and relationships, geometry, and spatial sense are explored. Kindergartners are engaged in mathematical thinking in two related contexts: with spontaneous involvement in the mathematical aspects of current play, and when teachers organize activities and projects specifically designed to challenge children to engage in a new area of mathematical thinking. In both cases, teachers support conversations and encourage children to formulate theories and test the theories themselves. Classrooms each have well equipped block areas, and a variety of concrete objects are available to count, classify, and sort. Small manipulatives, sequence puzzles, beads, pattern blocks, Geoboards, are all used regularly in each classroom, chosen carefully by teachers to offer children both practice and challenge. Sand and water play are available on a regular basis, with many tools available for mixing and measuring. Books, rhymes, games, songs, and dances all can incorporate mathematical thinking, as can dramatic play areas which include grocery or other shopping themes, etc. 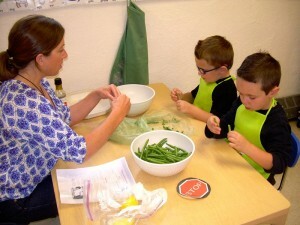 Each class cooks on a regular basis, taking opportunities to read and create recipes, measure, and count. 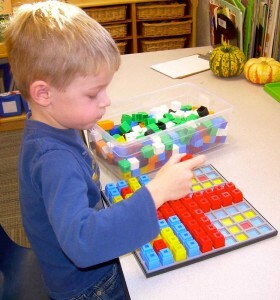 A mathematical focus is also supported through the arts, as children create patterns of color, glue and organize materials, or create two or three dimensional shapes and sculptures with dough, recycled materials, paper and tape, or play with rhythmic patterns and other patterns of sound in music. Both standard and non-standard systems of measurement are used as children think together about the comparative sizes of their constructions, or measure the classroom, playground, or their own bodies. The classroom environment incorporates simple charts and graphs as record of shared experiences from which on-going conversations can occur. Tell about why and what would happen if? 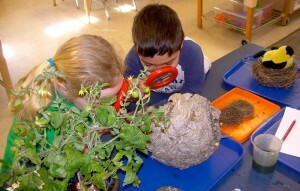 Specific areas of inquiry include those described in the Massachusetts Curriculum Frameworks: earth and space science, life science, physical science, and technology. Technology is defined broadly and involves thinking about how things are made and how they work, and includes thinking about the systems we use to solve practical problems. As children play, they problem solve together, and use a variety of classroom tools that may include high technology like computers or digital cameras, or may involve gaining an understanding of simple tools like gears, levers or wheels. Investigate simple machines such as ramps, gears, wheels, pulleys, and levers through play experiences. When teachers introduce high technology like computers, their use is related to hands on activities and integrated into classroom experiences. Screen time is limited. Children need time with a variety of materials to explore possibilities and develop the skills necessary to express their feelings and ideas through art experiences. Kindergartners freely use crayons, chalks, pencils, a variety of paints, clays and dough, scissors, glue and tape, textiles on a regular basis. They are encouraged to experiment with the materials at hand, combining them in new ways as fundamental concepts and skills are developed. Both two dimensional and three dimensional projects are encouraged. Kindergartners talk with others about their work, and in doing so develop a language to describe their processes, reflect on their work, and make connections to other children’s approaches present in the classroom. It is the process of creating that is most important, so process is emphasized, rather than finished products. 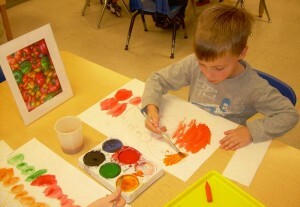 As the Kindergarten class becomes more experienced with materials, teachers begin conversations about the visual arts in history and culture, including discussion of techniques used by artists that can inform the children’s work. Musical experiences are incorporated into the daily life of the classroom, through use of a classroom music center, classroom books and song cards, and by incorporating singing times into the daily routine. The Kindergarten sings and listens to music from a variety of repertoires and cultures, and the children are encouraged to develop comfort in singing alone and with others (in tune) and careful listening to others (ensemble). We make music with a wide dynamic range, as children sing, whisper, chant, or talk, at a variety of levels. 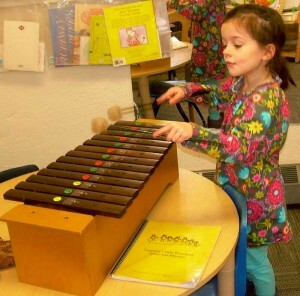 Music readiness skills in rhythm (keeping the beat) and basic movement are explored. By using basic patterns and tools over time, children become increasingly comfortable improvising their own rhythmic and melodic patterns. A variety of instruments from diverse musical traditions are available to children both for free exploration and for use in more formal music times. Time and space are set aside regularly for singing and movement games, chants, and creative dance with music. Children in Kindergarten become aware that systems of notating music are useful ways to remember and share musical ideas. From this beginning understanding, the children develop an awareness of common musical notation. Fine motor development is supported through the diverse materials available in each classroom daily, including (but not limited to) a variety of small manipulatives, pegboards, puzzles, lacing cards, materials for drawing, painting, and modeling, materials for writing, Teachers choose these materials with care, so Kindergarten children have time for practice and have opportunities for appropriate challenges as they develop. The Kindergarten curriculum is embodies the importance of physical fitness and an active lifestyle. Children are encouraged to participate in active play, and to develop personal skills at their own pace, with a goal of developing self-confidence in movement. Activities that support gross motor development (for example, the use of scooters or balls) are used on a regular basis. There are daily opportunities for running, jumping, balancing and climbing. In addition to time for free play, the program focuses on the development of basic movement skills and on applying movement concepts to the development of new skills. The curriculum fosters the development of a vocabulary for movement (for example high/low/fast/slow, heavy/light, balance, twist). Children have many opportunities to participate in group games, with an emphasis on non-competitive inclusion of all. 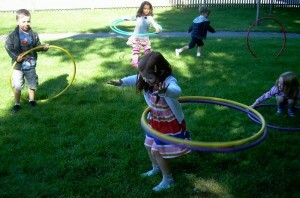 Children participate in creative movement experiences on a regular basis, often in connection to the music curriculum. As children explore movement individually, the Kindergarten program encourages both understanding and respect for individual differences among people in terms of their interests and skills. As teachers plan the curriculum, attention is given to the children’s need for on-going access to a variety of sensory materials, including sand and water play, and the use of varied clay and dough textures. Games that support children’s growing awareness of directionality and positioning in space are incorporated in the school routine. Planned activities address a wide range of motor development needs, including the need to build general body awareness, and to encourage the use of both sides of the body through activities that require bilateral coordination. Children are encouraged to participate in activities that support developing comfort with alternating use of left and right sides of the body (crossing midline), to develop a pincer grasp and finger strength and dexterity, and to improve visual motor skills and eye/hand coordination. The Kindergarten health curriculum encourages children to develop positive habits for self care, and to understand ways to stay healthy. The daily schedule allows time and space for physical activity, and allows time for rest as well, with the understanding that each child’s needs for rest and activity are different. Meal and snack times are relaxed, with opportunities taken to serve a variety of nutritious foods and to talk about the many kinds of healthy foods available. The classroom environment is one that encourages independence and the development of self-help skills. Positive interactions between both children and adults are supported as children are guided towards the appropriate expression of feelings, peaceful conflict resolution, and the development of communication skills. Conversations about family include awareness of diverse family systems, discussions of the jobs and contributions of family members (i.e. the responsibilities that go along with community life). In these discussions, the children can talk to about their own challenges or successes. 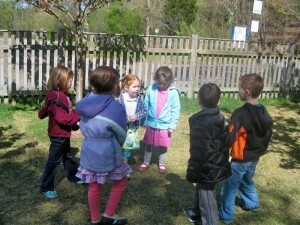 Learning Circle encourages Kindergartners to see themselves as models for younger children at the school. Kindergartners will be encouraged to embrace honesty, kindness, trustworthiness and respect – traits that lead to positive self concept and interpersonal relationships, and to express their feelings and ideas in a direct and constructive manner. The Kindergarten curriculum emphasizes an awareness of self, both as an individual and as a member of a group (family, school community, culture). Children are encouraged to identify ways in which they might be similar or dissimilar to others, and to respect diverse points of view. We work to have children develop a willingness to participate in community life – to cooperate with and respect others, to work together, to participate in setting classroom rules, and to balance personal needs with the needs of others in the group. Teachers support each child’s social development through modeling, encouraging connections, and direct work on problem solving and conflict resolution skills. Kindergartners work in small flexible groups on extended projects, and may use dramatic play as a vehicle to explore themes relating to the social sciences curriculum. Teachers build opportunities into the curriculum to develop basic mapping skills and to help children begin to understand that symbols can represent people and places. The calendar is a part of every day’s routine, supporting an awareness of passing time, marking milestones in the year, the passing seasons and the children’s own history. Kindergarten children are encouraged to share observations and descriptions of places in their own personal experience or that have importance to other family members. The curriculum aims to stretch children’s sense of community by thinking about how peoples of different cultures share basic human needs, even when cultures meet those needs in diverse ways. By reflecting on personal experience, chronological thinking is developed, as children begin to develop a concept of how things change (my self as baby, toddler, now, or family life now, in the recent past, or long ago, for example).